Blood orange moon due to Canyon Fire smoke. Taken with no filter and no post processing. This week there was a lot of smoke blowing over at altitude from the Canyon Fire just south of the 91 freeway and east of the 241. 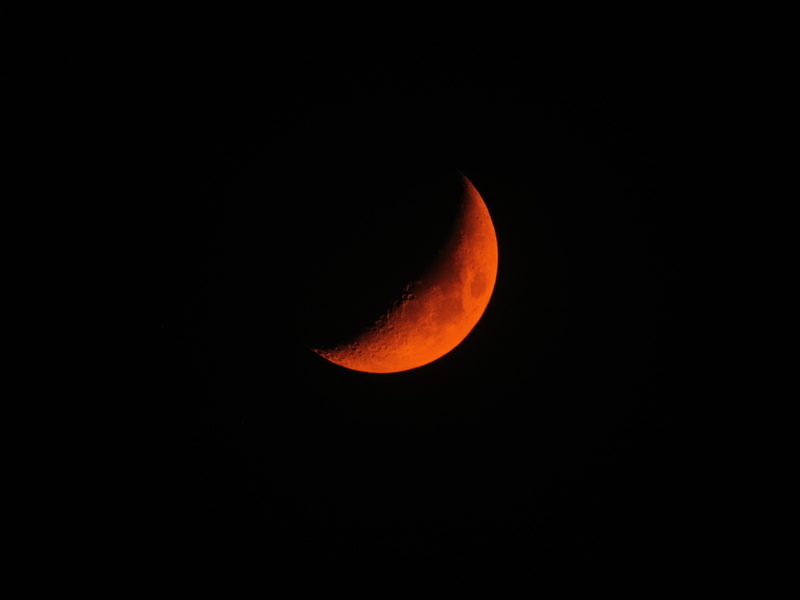 This caused the moon to glow a color very similar to a blood orange. Jamie decided to capture this image at first using a mirrorless camera with a moderate zoom. The results were that the image didn’t do justice to what her eyes could see. She called me up and I suggested using the Canon SX530HS. This camera has drawbacks to be sure. For one thing it shoots only in jpeg and it has a very small sensor. However, the 50x optical zoom has a 35 millimeter equivalent focal length of 1500mm. On a full frame SLR this lens would be so big, you couldn’t easily pick it up but on this camera it’s all lighter than any SLR body. So Jamie set up the camera on our gorilla pod, zoomed in all the way and used the timer function to eliminate movement from pressing the shutter. Then she set the white balance to daylight and took the shot you see above.